While Rich in Color’s mission is to share current diverse novels, we must not forget the Classics. The trailblazers, the writers who chose to write stories featuring characters of color before readers demanded it. These novels moved readers when they were first published and move readers still, as well as inspired generations of writers of color. Therefore, we are instituting a new series here on Rich In Color, titled Flashback in Color, exploring those classics novels that are beloved by all. This post was inspired by one of my 7th grade students bringing in Mildred Taylor’s, “Roll of Thunder, Hear My Cry”. This Newbery Award winning classic was published in 1976 and is still loved by readers. I, in fact, read the book when I was in 5th grade, and my heart still warms from the memory of the novel. Set in Mississippi during the Great Depression, the novel follows the events surrounding the Logans, an African-American family who own their farmland, unlike many African-American families of the time. The novel explores the tension of racial relationships created by the poverty of the Depression. When I read the novel as a child, I was extremely happy to read a novel, a compelling novel, that featured a character who looked like me. I was a voracious reader, and Roll of Thunder was the first time I remembered thinking, “Here is a black character I could relate to. She’s not the only one, or the friend. It’s all about her.” It was so uplifting for an 11 year old inspiring writer. One of the reasons why, I think, Taylor’s novel has stood the test of time is that the character of Cassie Logan is written so strongly. She is fierce, stands up for what she believes, questions her world and ultimately overcomes the obstacles thrown her way. Who wouldn’t want to took up to a character like that? Taylor also doesn’t hold back with the racism that Cassie and her family experience. After everything her family goes through, you want them to win, to come out on top. In that aspect, with such a sensitive subject, the very fact that Taylor speaks to the young reader, not at the reader, is why adolescents since 1976 have fallen in love with the novel and why it is still taught in schools. Thanks for including this. I introduced the book to my daughter a few years ago & it brought up a lot of discussion about race, racism and how slavery morphed into the sharecropping/Jim Crow system in southern states post-civil war. I’m saddened that it doesn’t seem to be on school curriculums anymore (thanks No Child Left Behind and standardized testing! ), meaning that many in this generation will miss an opportunity to read it. I love this book, too. So much so that I ended up going to the lit class that was teaching it in sixth grade even though I had already read it. Roll of Thunder and the other books in the series were the first time I’d ever read about the sharecropping/Jim Crow system, and I was fascinated by it. I hope my old junior high continues to teach it! Great choice!! I hope more kids today will read it. Thanks for your review! I just finished the book and loved it. As part of the preparation for reviewing it on my blog, Kid Lit About Politics, I’m looking for other blog reviews. Your’s is great and I’m going to include it in my list of other blog reviews (if you don’t mind. If you do mind, let me know!). 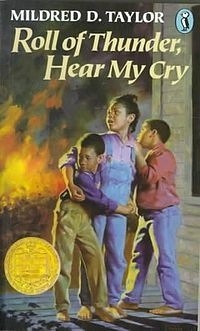 Roll of Thunder, Hear My Cry is one of my favorite books. Hundreds of times during my childhood, I plucked our beat-up brown hardcover copy from the hall bookshelf. Settling myself in my favorite reading spot, a small corner nook in the living room where the love seat and sofa touched, I would spend hours lying on the puke-green shag carpeting next to the big window reading. I haven’t read Roll of Thunder in over fifteen years, but I can still recite the poem at the beginning of chapter 11.